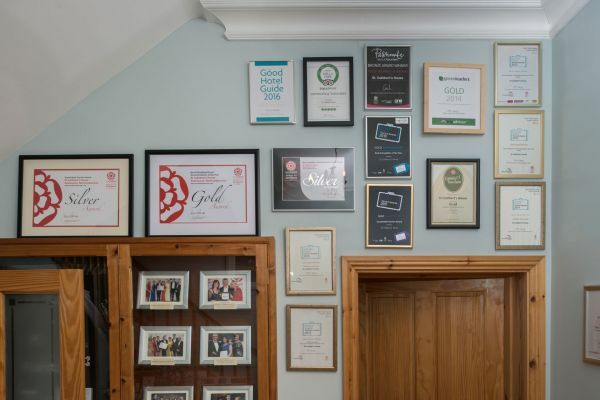 St Cuthbert's House was awarded 'England's Best B&B' in 2017 & 2014 by VisitEngland - and also Bronze & Silver medals at their national Awards in 2015 & 2016 too. 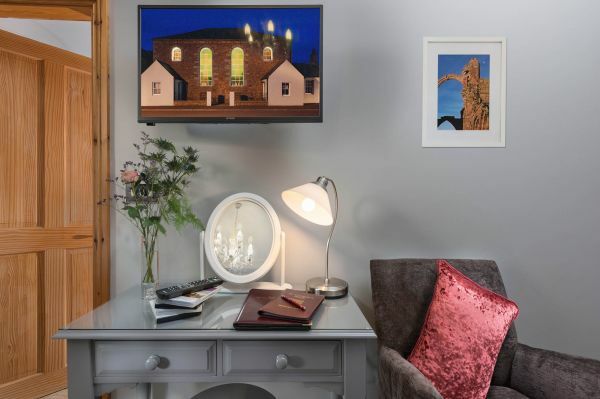 St Cuthbert’s House is a luxurious, award-winning B&B in a 200 year-old former chapel - a unique and stunning renovation, situated in Seahouses, near Bamburgh on the beautiful Northumberland coast. 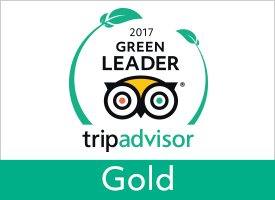 It’s just a stroll along the beach to Bamburgh Castle, and a short drive to Alnwick Castle & Gardens, or Lindisfarne – Holy Island. 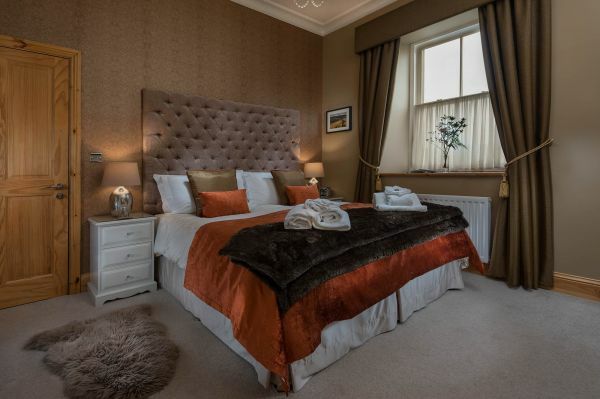 You'll be situated at the very heart of the beautiful Northumberland Coast. We have a page dedicated to walking the Northumberland Coast Path (and the coastal sections of St Oswald's Way) which you really should check out if you're following that route. 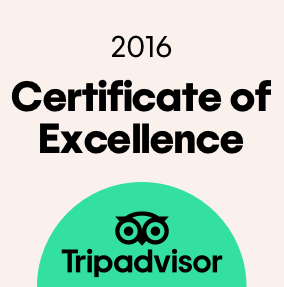 It's a peaceful, unique and very special place to stay. 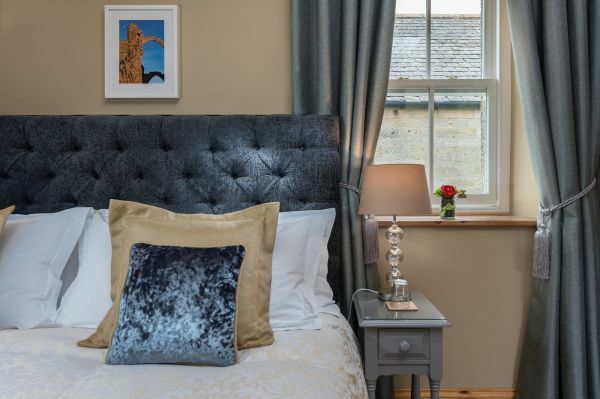 This lovely, historic Grade II listed building has been tastefully renovated to provide you with beautiful, luxury Bed and Breakfast accommodation, brimming with high-quality facilities. 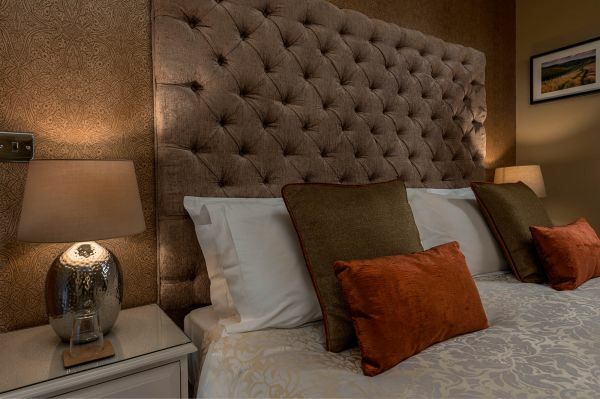 We've taken care of every detail in your room, including the sumptuous pocket-sprung SuperKing-sized beds, with lovely crisp Egyptian cotton sheets, gorgeous duvets and king sized pillows - after taking in some fresh, clear Northumberland air, you'll sleep deeper and softer than ever before. 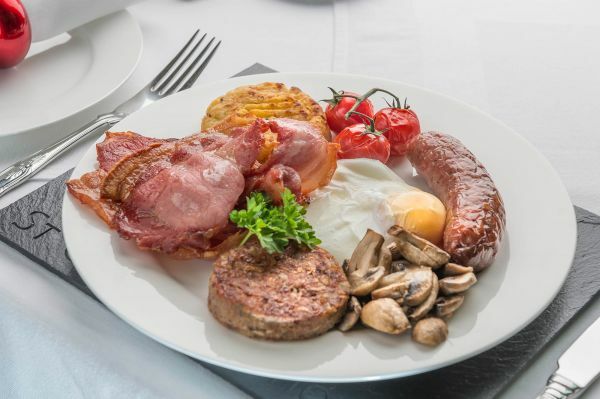 In the morning, you can enjoy a fabulous breakfast, choosing from an extensive and locally-sourced menu; local sausage and bacon from our butcher, free-range eggs from a nearby farm, or dishes made with traditional oak-smoked fish from the Seahouses smokehouse - birthplace of the original kipper. 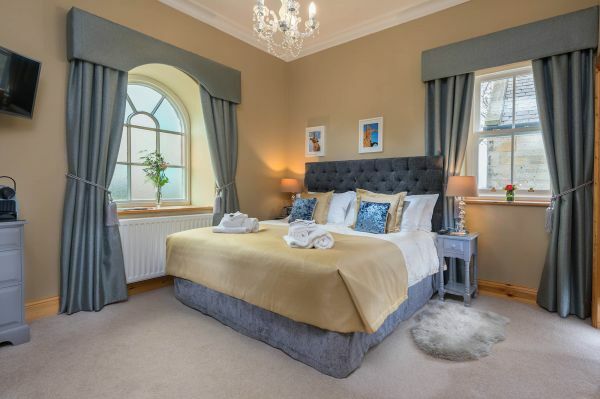 The Aidan Room This first floor double room is a south-facing front room, with a beautiful original arched frosted glass window, which lets the morning light flood into the richly coloured room. The en suite bathroom has a very large shower enclosure, so there’s plenty of room to turn around as you take an intense shower amidst decadent black and chrome. However, it's worth pointing out that the entrance to this shower is via a door which is just 15" wide - so if you are very generously-proportioned then this detail can be important! 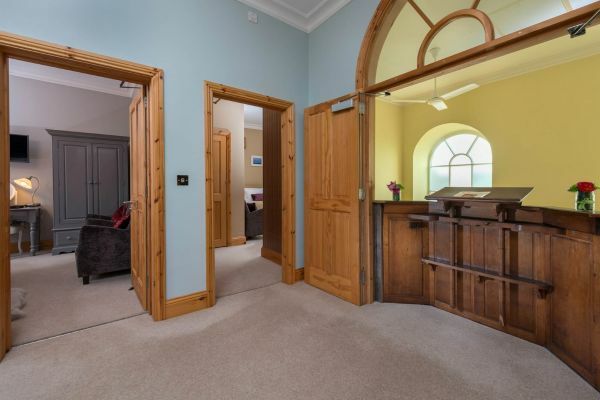 The Columba Room This first floor double room is another stunning south-facing front room, with a beautiful original arched and frosted window. 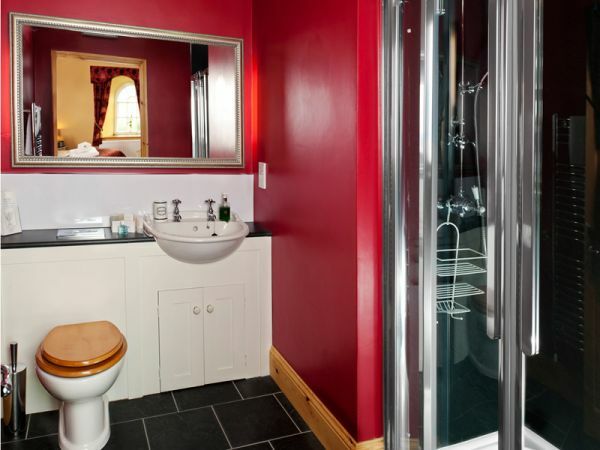 The en suite bathroom has a very large shower enclosure, offering a very satisfying shower-experience amidst a rich setting of chrome, black and deep red. However, it's worth pointing out that the entrance to this shower is via a door which is just 15" wide - so if you are very generously-proportioned then this detail can be important! The Brigid Room This quiet first floor room floods with afternoon sunlight. The ensuite bathroom has a comfortable bath for you to soak in, with classic, heavy chrome fittings, and a shower area at one end. The Hild Room Another first floor room which fills with afternoon sunlight - and which offers a glimpse of Bamburgh Castle over the rooftops! Again, the ensuite bathroom has both luxurious bath and shower. The Bede Room Ground floor room, offering easy, level access to the room from the car park, and into the dining room and all communal areas of the house. 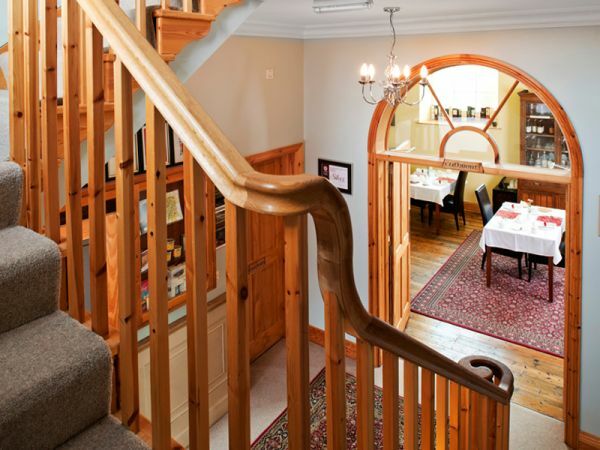 It is therefore particularly suitable for guests with mobility problems. 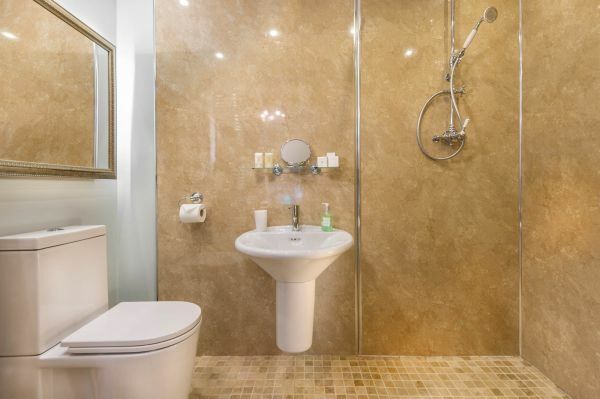 Slightly larger en suite bathroom, with a walk-in wetroom making for a really decadent showering experience. 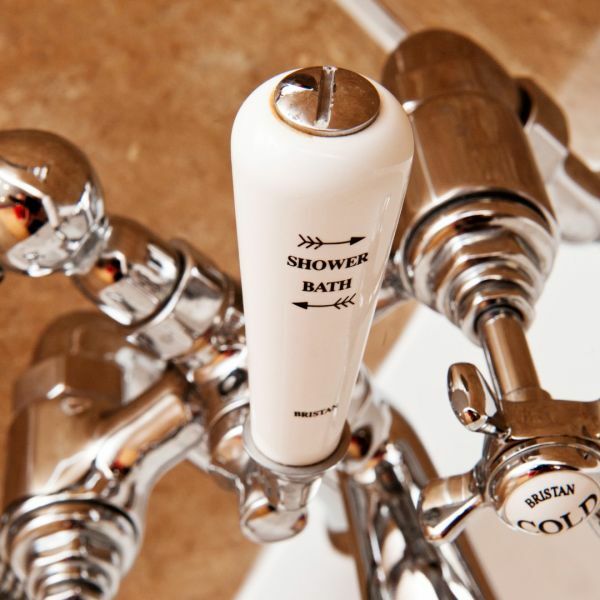 The bathroom can be equipped with grab rails if required by less mobile guests. 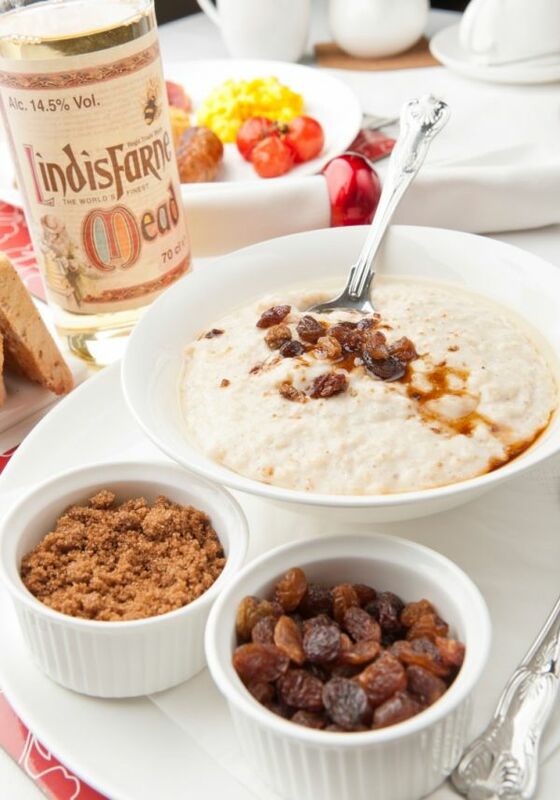 Your Breakfast If you fancy treating yourself to a traditional, hearty Northumbrian Breakfast whilst you're here, you'll enjoy the highest quality ingredients, beautifully prepared and elegantly presented on fine bone china. And even if you're watching your waistline, you can enjoy it with a (relatively!) clear conscience, because none of it sees a frying pan! 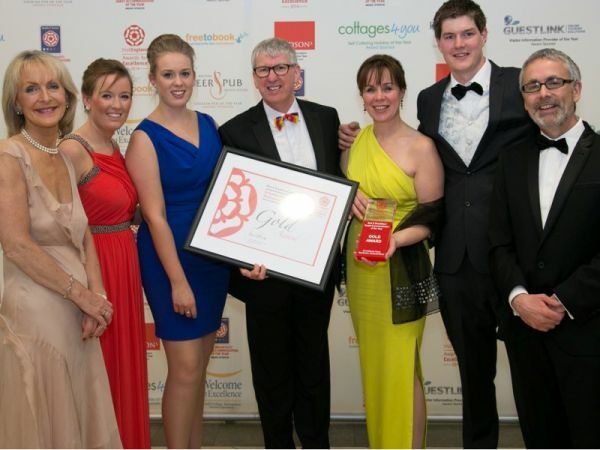 We source sausages and bacon from our award-winning local butcher. His meat comes from locally-reared and fully traceable stock, and he’s a passionate advocate of high-quality local produce. Our eggs come from free-ranging hens on a nearby farm, and the yolks are so bright and yellow you almost need sunglasses. 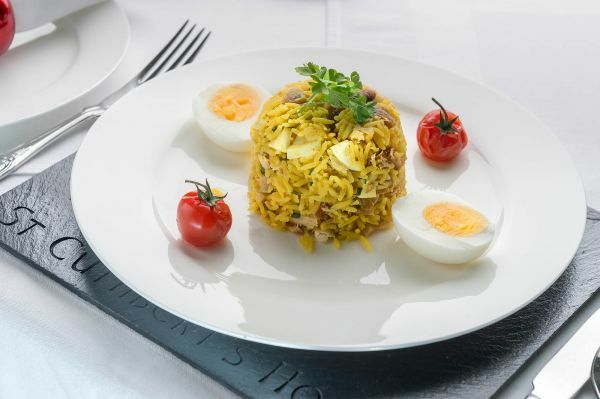 Also on the menu you'll find delicious kedgeree, made with oak-smoked haddock from the Seahouses smokehouse. 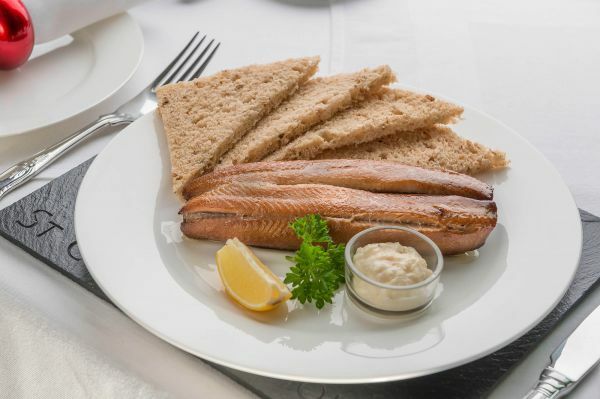 Of course, since Seahouses is the birthplace of the original kipper, our breakfast menu includes kipper fillet, and home-made kipper pate too. 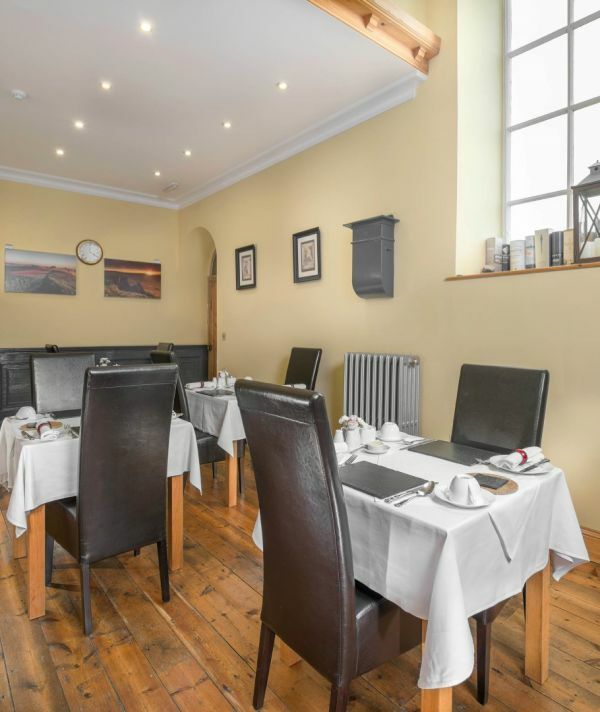 There’s always a range of Specials on the menu too, so typically you’ll have ten delicious main courses to choose from – there’s something for you, whatever you like to eat! 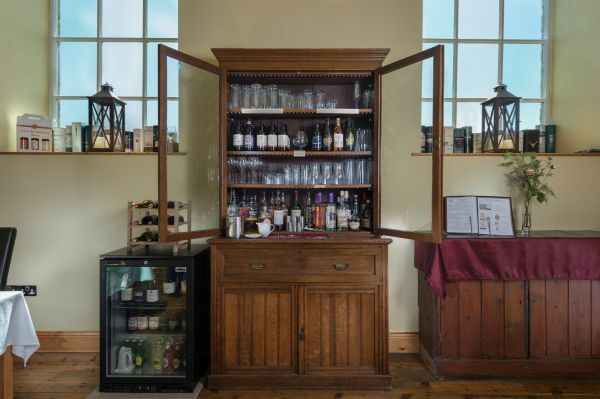 You can also help yourself from the buffet table too, stocked with fruit, cereals and juices, and preserves and honey produced by artisan local producers. And of course we can cater for special diets, so just tell us if there are things you need - or need to avoid. 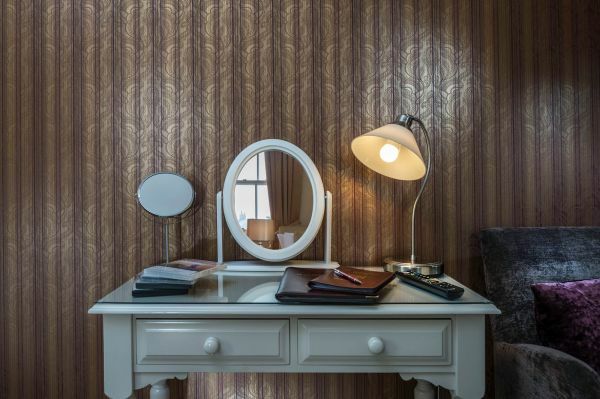 If you would like to stay in a specific room, then please tell us, by making a note with your booking - and we will do all we can to accommodate your request. 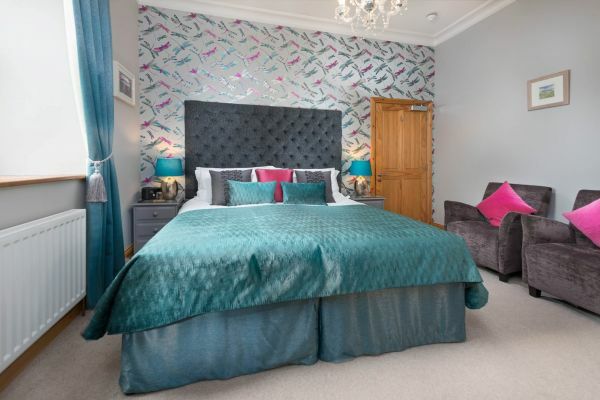 However, your specific choice of a particular room cannot be guaranteed - we have just six rooms, and sometimes it's impossible to accommodate every combination of room and date request! If you have any questions do please call us or send an email. St Cuthbert's House is not suitable for divers. We cannot accommodate pets. We welcome well-behaved children over 12 years. 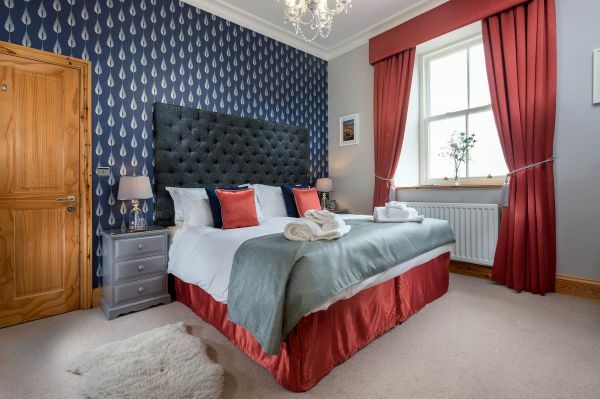 *On Bank Holiday weekends, we make bookings of three consecutive nights available. Our prices for the summer months assume a stay of at least two consecutive nights. Single night stays may be available, but may carry a surcharge. 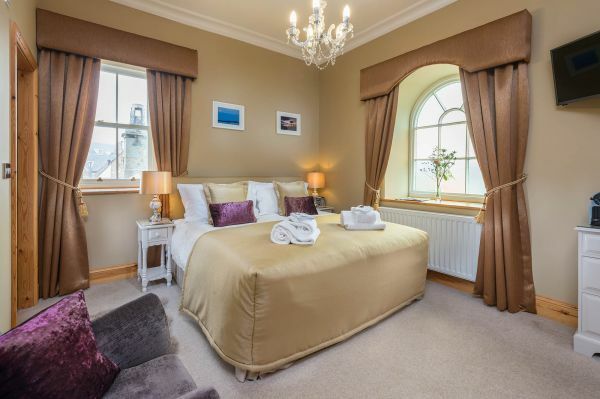 Single occupancy charged at £75 to £90 B&B per room per night. We have an off-street car park available, which is big enough for everyone as long we all park considerately. Please park within a marked bay, with your bonnet TOWARDS the fence! 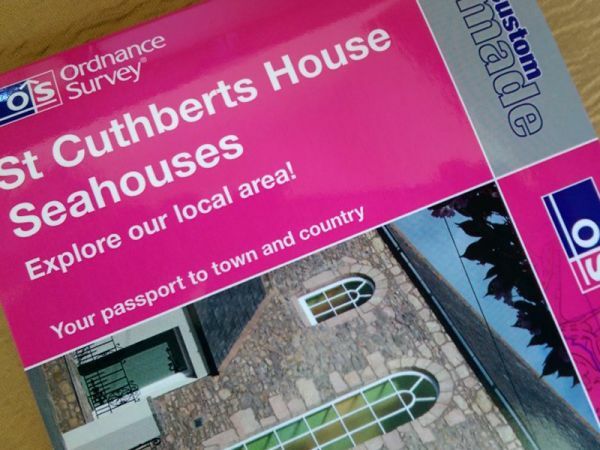 St Cuthbert's House is fully licensed. As well as 'the usual stuff' we stock a wide range of craft-brewery real ales, all brewed locally - including our very own house-beer. Fantastic. 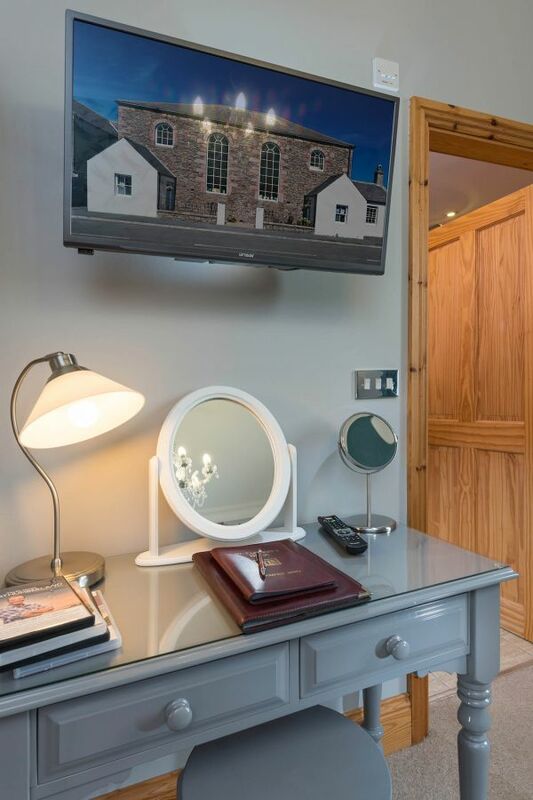 LCD HD television with integrated DVD player and Freeview digital channels including HD. Not your usual rubbish 'hotel' style hairdryer, but a pro salon-quality item which dries double-quick. 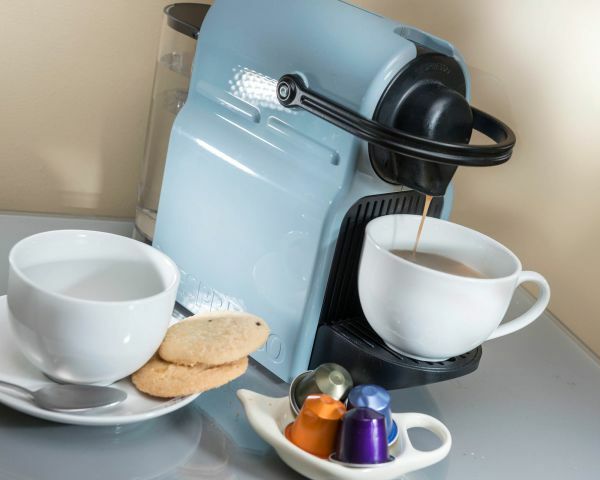 You'll find a Nespresso coffee machine in your room, as well as a kettle and well-stocked drinks tray. Fresh milk is always available for your tea. Local biscuits too. We can store your bikes securely in our private garage. We have in-depth knowledge about bus timetables, local walks and waymarked routes, lunch and tea-break stops, birdwatching hides - and anything else you might need. We also have a stock of gpx files, if you're suitably equipped. Fast ethernet ports are available in all bedrooms, and in the main Cuthbert Room. There is also a wireless network available. 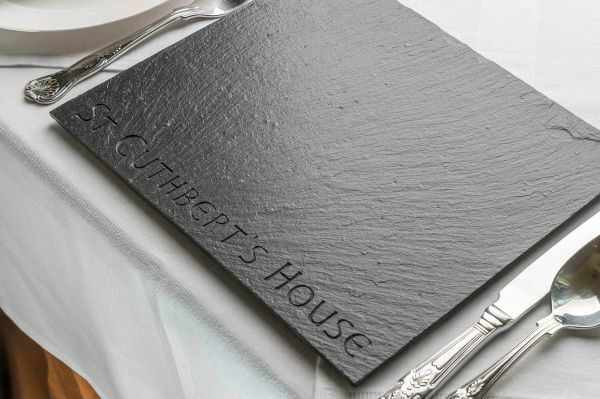 We could write reams about how perfect St Cuthbert's House is, about the warmth of Jill and Geoff and the amazing food. 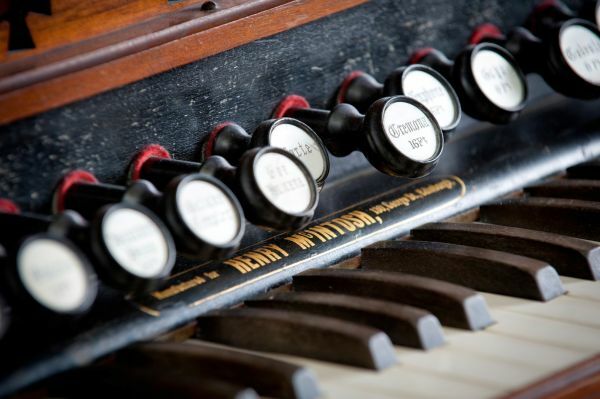 There isn't room in this little box - just go and see for yourself; it's incredible. My husband booked a surprise 2 nights here as a birthday treat and it could not have been more perfect. Jill and Jeff couldn’t be there to welcome us but their instructions on how to let ourselves in, plus a birthday card for me, were a lovely touch. The room was beautiful, huge bed, soft classical music playing all of which which sent us both to sleep immediately! 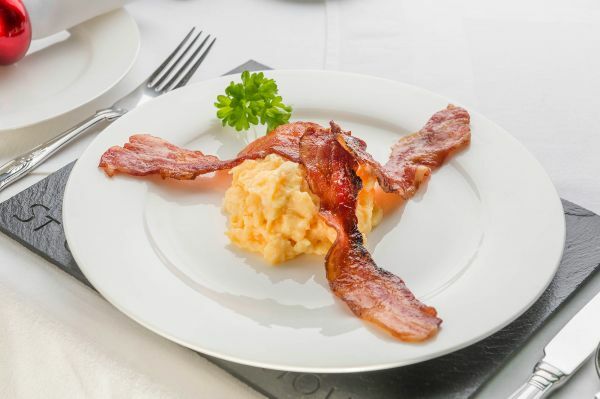 The breakfasts were truly delicious and beautifully presented. Nespresso in the room was a winner for me too! I have honestly never stayed anywhere so absolutely lovely (and I travel all over the place for work) Thanks to you both Jill and Jeff for a wonderful time. We will be back! 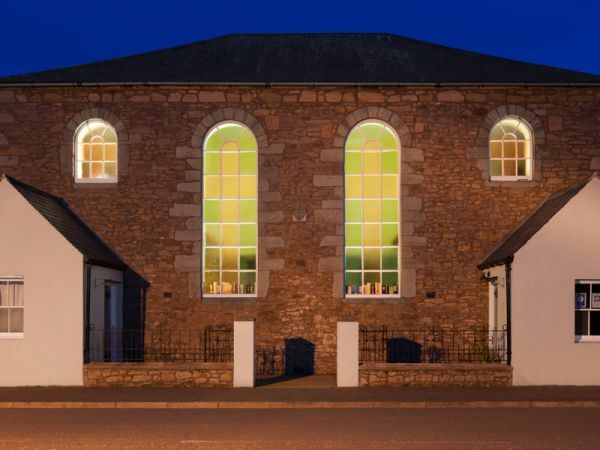 What a fabulous building to stay in! Full of character and so comfortable. Jeff and Jill are the perfect hosts and nothing is too much trouble. The breakfasts (so many combinations to choose from) are delicious. 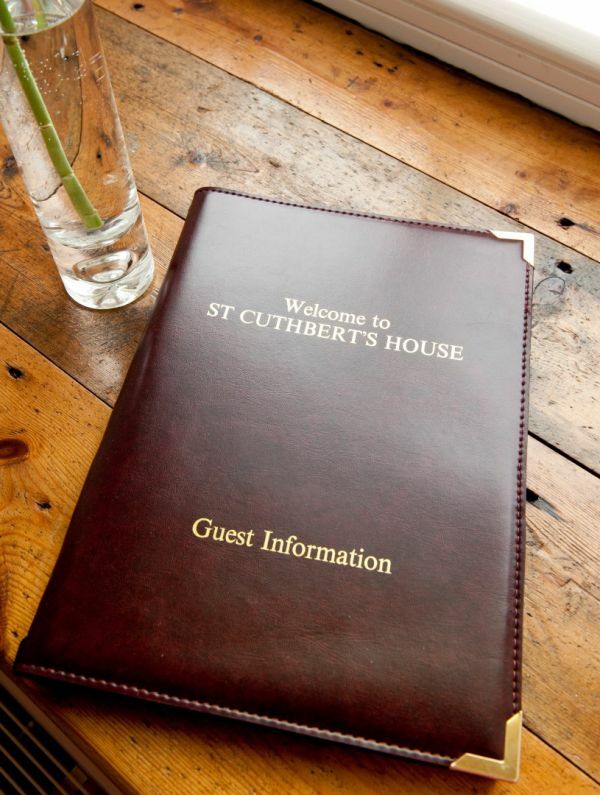 I would go as far as to say that our stay at St Cuthbert's House was perfect. 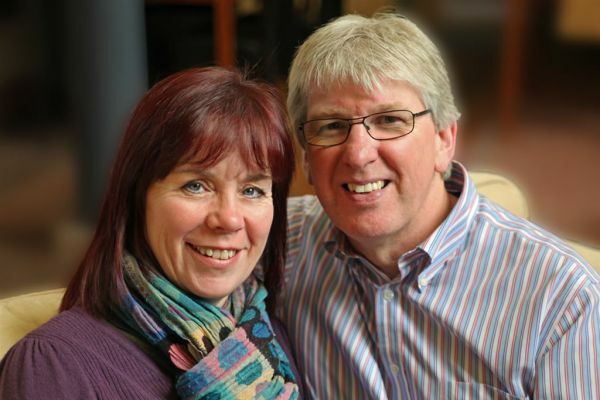 We were greeted by Jeff and Jill when we arrived and made to feel extremely welcome. Our room was spotless with beautiful décor. We stayed for 2 nights and the breakfast on both mornings was excellent with a large choice from which we chose the night before so that we didn't have to wait for it to be cooked the following morning. Jeff gave us lots of information of where to visit and also places to eat on an evening. 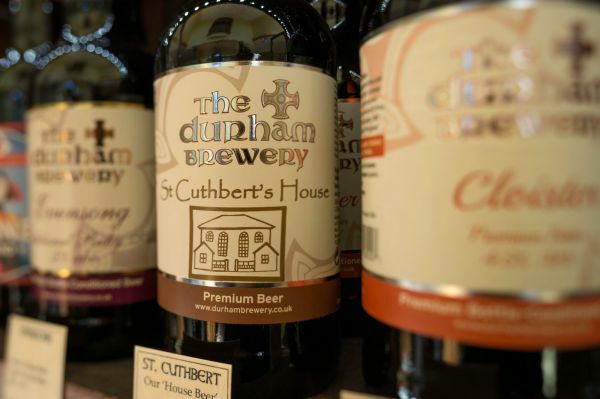 We would have no hesitation in returning to St Cuthbert's House when we visit Northumberland again. 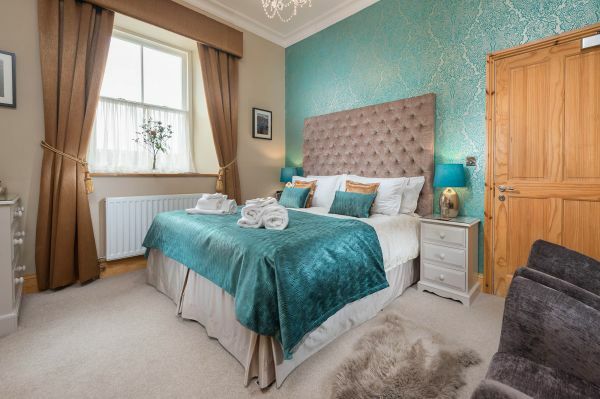 This is a lovely b and b. 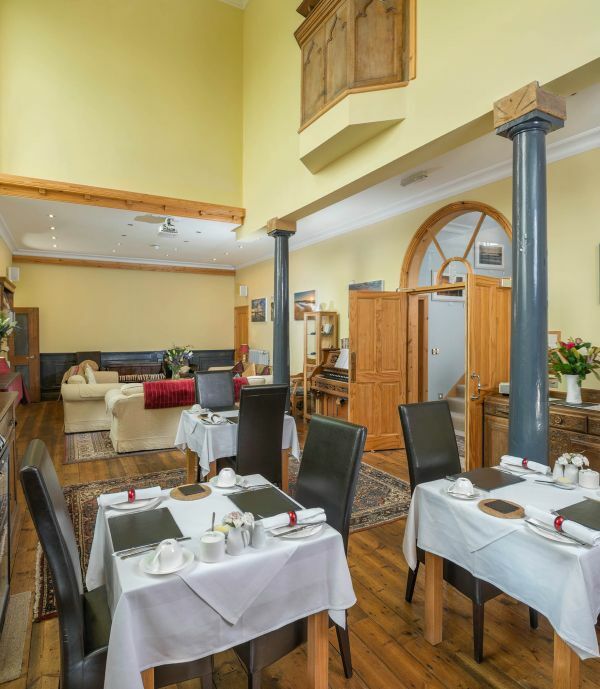 Everything perfect from the first warm welcome to the delicious breakfasts, from the fantastic room with plenty of really hot water to extremely comfortable beds. Jeff and Jill have thought of everything. But, above all, Jeff was so good about suggesting places to visit which otherwise we would not have found. 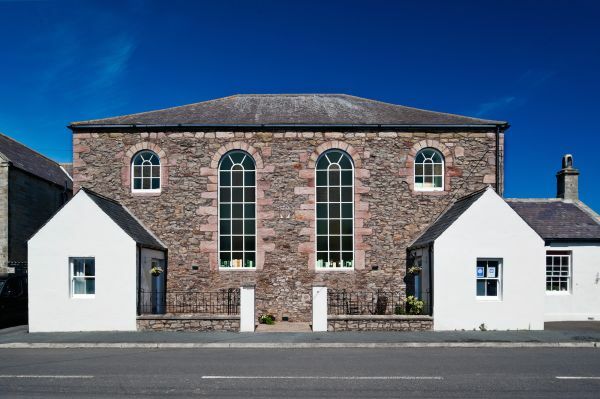 St Cuthbert's House in Seahouses is a great location for a visit to Northumberland. Everywhere is within easy reach. 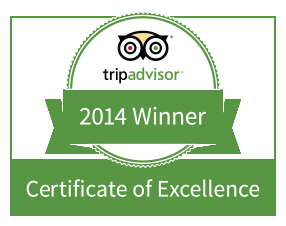 Our Awards are your reassurance! Solve your gift conundrum with a Gift Voucher!